The Cessna Citation M2 Engine is the Williams International FJ44-1AP engine. Two FJ44-1AP engines are mounted at the back of the light jet. The Citation M2 specifically uses the FJ44-1AP engine with the part number 72100-201. The previous version of the M2, the CJ1+, used the FJ44-1AP engine with the part number 72100-200. Some call the engine the FJ44-1AP-21 to note the part number difference. Williams International applied for a type certificate for the engine from the Federal Aviation Administration (FAA) on January 28th, 2004. On June 1st, 2005 the company received certification / a type certificate for the engine from the FAA. The jet turbofan engine is produced under FAA Production Certificate 334CE. 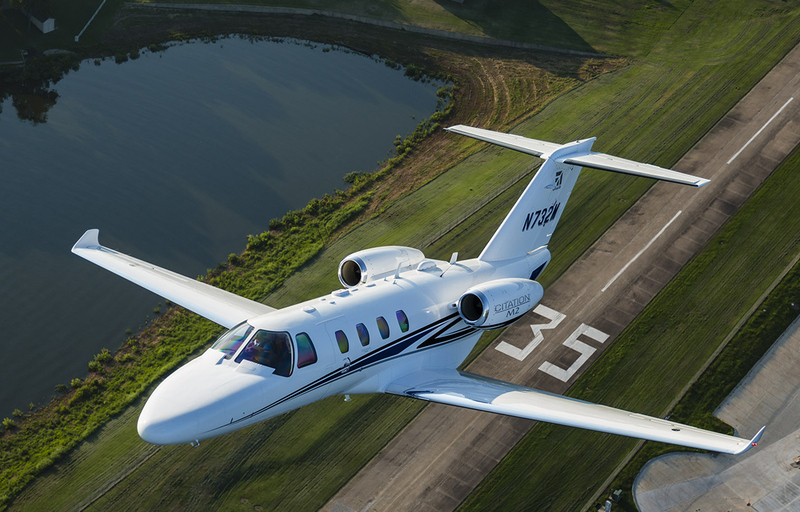 The Citation CJ1 line has been using the FJ44-1A series engines since the program was started by Cessna in 1992. The FJ44-1AP is similar to the original FJ44-1A engine. The main differences are that the -1AP has a new fan and the low pressure turbine and Dual Channel Full Authority Digital Electronic Control (FADEC) from the FJ44-3A engine have been added to the -1AP. Above photo by Cessna. Used under the fair use provision. The Williams International FJ44-1AP engine is a "Twin spool turbofan with a single-stage fan and single-stage axial compressor direct driven by a two-stage turbine, a single-stage centrifugal compressor driven by a single stage turbine, an annular combustor a full length bypass duct and an exhaust mixer (From FAA Type Certificate for the Engine)." Above FJ44-1AP engine photo by Williams International. Used under the fair use provision. Below is information on the specifications of the engine. One Engine Inoperative (OEI) Operation: The engine may use takeoff thrust for 10 minutes if one engine is inoperative during takeoff. Maximum: 120 pounds per square inch (psig) or 130 psig for 5 minutes at or above high pressure rotor N2 speed of 32,960 RPM. Minimum: 23 psig for 5 minutes from idle to high pressure rotor N2 speed of 32,960 RPM.